Monday the 30th of August is a Bank Holiday in the UK. There are no postal collections or deliveries on this day. All letters sent after close of business (5pm) on Friday the 27th of August will be sent on the next available working day Tuesday the 31st of August. London Underground workers are to stage a series of strikes over planned job losses. Members of the Rail Maritime and Transport union and the Transport Salaried Staffs Association will walk out for 24 hours from 5pm on the 6th of September. More strike action is also planned for the 3rd of October, 2nd of November and 28th of November. The move comes in protest over plans to cuts 800 jobs among station staff. They are likely to cause widespread disruption and could cost the economy millions of pounds. We are aware that the PC2Paper website experienced some downtime between 2am and 5am UK time on the 19th of August due to problems with our servers. We are sorry for any inconvenience this may have caused. The website should now be working normally. If this article is correct rail fares could be set to rise by 10%. The news comes after the publication of July's inflation data. Under current rules train operators are allowed to raise fares by one percent more than the retail prices index (RPI). This stood at 4.8% last month suggesting that fare increases of 5.8% are likely in 2011. Passenger groups, however, are warning that the government is likely to change these rules which would allow companies to raise prices by significantly more. This could in effect mean they could raise some fares by as much as 5% over RPI a rise of nearly 10% in total. Passenger groups point out that passengers in Britain already pay some of the highest fares in Europe. They are calling train operators to show restraint in price rises especially as wage rises are currently lagging behind inflation meaning many customers could struggle to find the extra money for their morning commute. Unfortunately it has been necessary to suspend our US based printing station due to technical issues. We would like to assure customers that all letters sent via the US printing station to date have already be sent and remain unaffected by this problem. We are working to solve this issue and hope to have the US based printing station back as an option as soon as possible. In the meantime all US based letters will be sent from the UK. According to this article a quarter of the UK's Blue Flag beaches are failing to monitor daily sewage contamination. The anti-pollution group Surfers against Sewage have revealed that a quarter of British Blue Flag beaches could be contaminated with sewage from overflows. The information comes from freedom of information requests to local authorities and beach operators. If correct this could mean that thousands of bather might unknowingly have been exposed to raw sewage whilst believing they are swimming in clean water. 131 British beaches have been awarded the Blue Flag status which is only granted if beach operators meet more than 30 strict criteria. The SAS research, however, shows that 35 of the 131 beaches do not meet criterion 28 of the Blue Flag code which require operators to inform the public during and after emergency pollution events such as sewage discharge. The beaches that have no system in place to monitor daily sewage pollution and warn people are listed below. 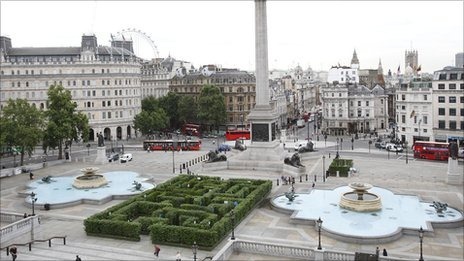 If you are heading into London in the next week then you might want to check out this giant maze in Trafalgar Square. It has been organised by the West End Partnership and is free to those who want to explore it. Parts of the maze have been named after areas of the West End so that visitors can learn about those places as they find their way around the maze. It will feature a different piece of entertainment from around the West End every day for five days. If you do want to visit it you need to be quick as its only available until the 6th of August. We do believe that the issue with some PayPal payments not registering in users accounts has now been resolved.